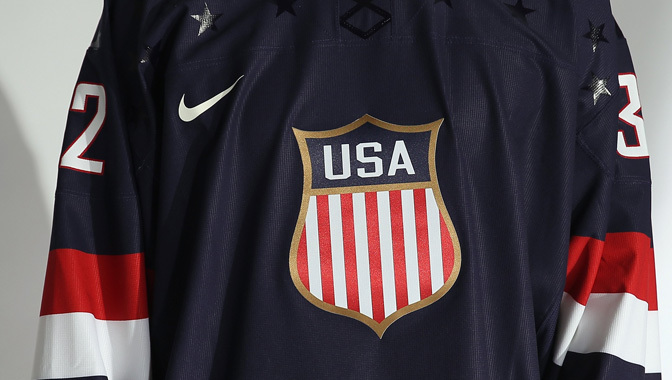 ARLINGTON, Va. -- The 2013 U.S. Men's National Team Camp concluded Tuesday with the introduction of all 48 players who participated and the unveiling of the United States jersey for the 2014 Winter Olympics in Sochi, Russia. The new logo is a shield with "USA" written in white with a blue background above red and white vertical stripes. There are also matte stars on the blue shoulders that are more noticeable when the sweaters move in the light. "I think it is classy and humble and something we can stand behind -- that shield," St. Louis Blues captain David Backes said. The jerseys will also say "land of the free, home of the brave" on the inside and feature an homage to the 1960 and 1980 gold-medal winning teams. "It is something to inspire us," Backes said. There was a standing-room only crowd at Kettler Capitals Iceplex for the announcement of the players and the jerseys. There were various activities throughout the day for fans, and teams from around the NHL were represented through T-shirts and jerseys. Players like Ryan Miller and Patrick Kane earned large cheers, as did Pittsburgh Penguins coach Dan Bylsma, who will coach the United States in Sochi. That's not a reception he's used to getting in this part of the country. The loudest cheers were reserved for the Wounded Warriors, who took part in a sled-hockey game earlier in the day and were on the ice for the introductions. Washington Capitals defenseman John Carlson also understandably received a voracious welcome. "[The jersey] looks great," Carlson said. "It is not too flashy, but flashy enough. It has been a cool event. It was convenient for me in that sense. It was cool was to see our fans turn into USA fans and everyone who came for all of the stuff today."